Andrew Droz Palermo and his cousin Tracy Droz Tragos return to their hometown of Rich Hill, Missouri and follow the lives of three different boys as they try to grow up and survive in the small town. This documentary is a look at those who may be less fortunate than most, but are attempting to make the most of their lives despite the various complications that arise. The documentary follows the lives of Andrew, Appachey, and Harley. Andrew is a high school student who has moved around dozens of times and is just hoping for the best, which would be to get out of Rich Hill with his family and settle down. Andrew, along with his sister, Alyssa, attempt to make the most of their time under whatever roof they're living under at the time with their rental friends. Appachey is a misunderstood middle-schooler with a less than ideal family life. He loves skateboarding and smoking. Surrounded by a troublesome past and daunting future, Appachey tries to communicate his frustrations as best as possible, but usually falls on deaf ears and blind eyes. Lastly, Harley is a high school student with arguably the worst background. His stepfather sexually assaulted him and his mother attempted to kill his stepfather. Harley lives with his grandmother and communicates with his incarcerated mother frequently. His anger is his biggest detriment and struggles in school. The three kids each have sympathetic stories that make you fortunate for everything you have, no matter how bad life can be. Each has a difficult story and leaves you rooting for each of them to succeed down the line. Palermo is the Director of Photography, as well as Co-Director on Rich Hill and his shots are absolutely stunning. Truly, some of the best footage and evocative scenes I have ever seen whether it be a Hollywood blockbuster or a lower budget documentary. Phenomenal work. 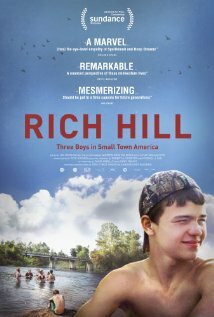 Rich Hill is an emotionally engaging, gorgeously shot, and incredibly dramatic look at the lives of those that live in small town America and the lives they lead, but more importantly, try to improve.